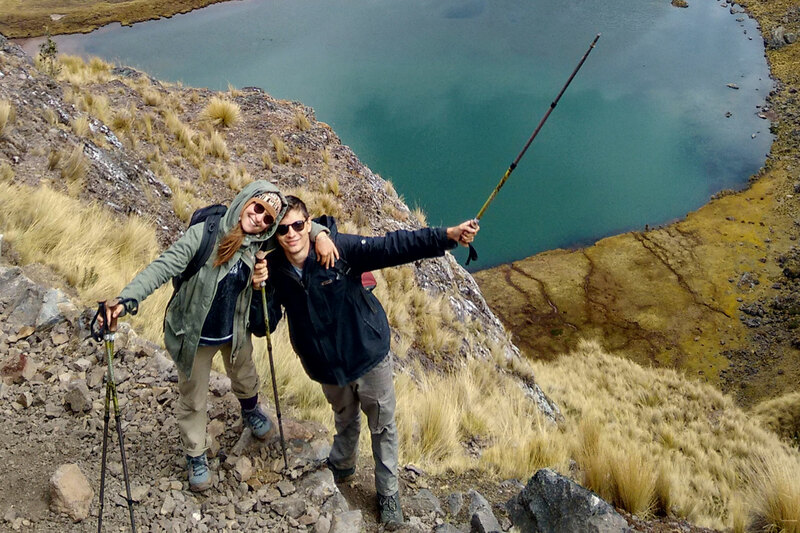 Lares Trek Machu Picchu 4days: The Lares Trek is a stunning trip designed to avoid the crowdedness on the traditional Inca Trail hikes. On the Lares Trek, there are great opportunities to experience wildlife, meet locals and enjoy the ancient Andean surroundings. The route of Lares Valley trek to Machu Picchu allows us access to high Andes of Cusco areas overlooking beautiful and spectacular mountains, beautiful landscapes with crystalline lakes and small Andean villages where native people survive on agriculture, fisheries and textileria. 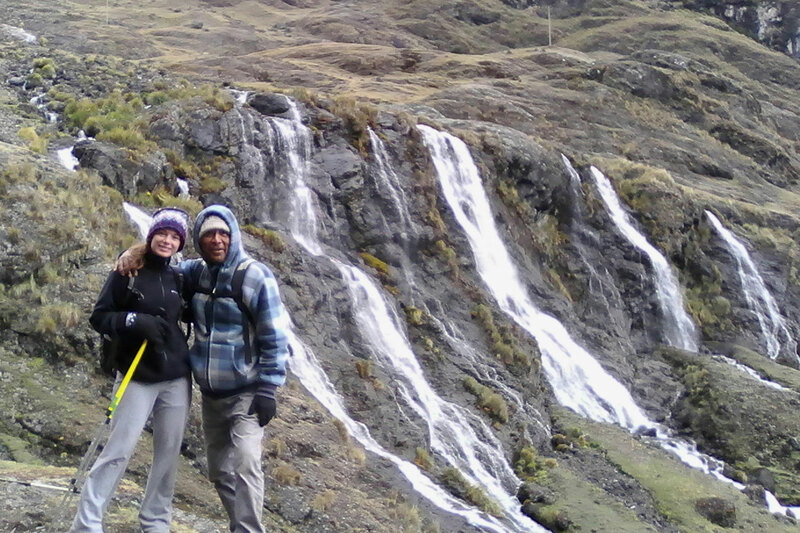 During the tour to the Lares Valley, varied flora and fauna seen in a magical landscape. The effort is complemented by a visit to the textile artisans showing the process of his works and visits to archaeological sites such as Ollantaytambo and Machu Picchu. Duration of the trek: 4 day trip trek to the valley of dollars. The Inca Trail is subject to availability. You can check the official number of spaces on the Inca Trail for the whole year 2016. 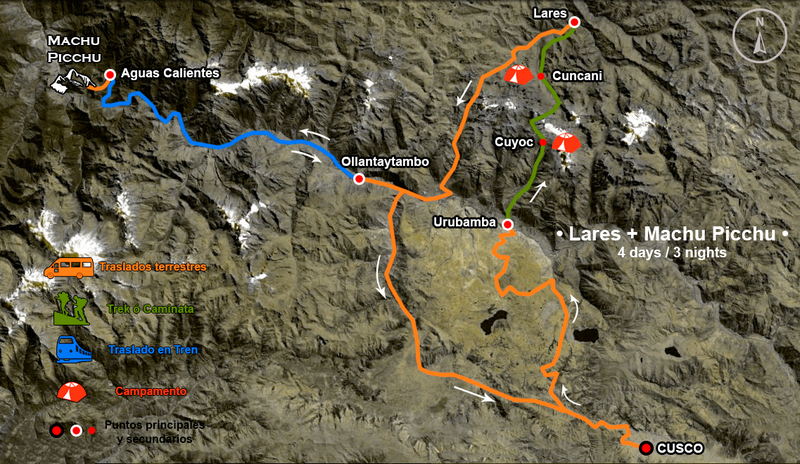 The adventure begins in Cusco from where we will leave by bus and travel to the Lares Valley (3,100 m/10,170 ft). There you can enjoy the hot springs or rest for approximately 90 minutes. This is also where we will have lunch. After lunch we take a 20 minute bus ride to Pascana, which is the official beginning of the trek. We will hike for approximately 2.5 hours and arrive at our first campsite, Quishuarani (3,700 m/12,139 ft) for dinner. Here you can meet the locals “campesinos” and learn about weaving and their ancient techniques. This is a beautiful day with Andean villages, stunning views and great landscapes along the route. Day 2 requires approximately seven hours of hiking and is the longest hiking day of the trek. After breakfast, we start ascending to the highest point of the circuit. 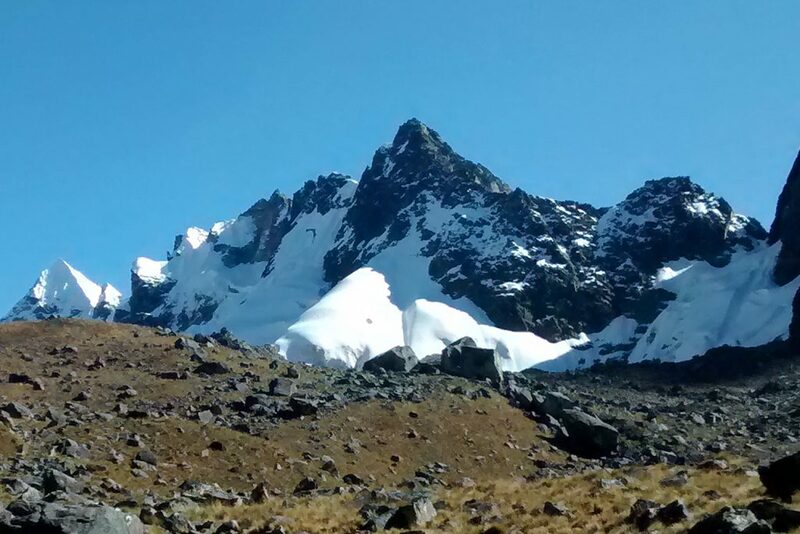 The climb is difficult until the Pachacutec Pass (4,450 m/14,599 ft). Once you reach the pass, you will be able to enjoy incredible panoramic views of the snow-capped peaks of Pitusiray, Sawasiray and Chicon. After the pass, we descend for about 2.5 hours to our camp at Cancha Cancha (3,800 m/12,497 ft). After a delicious breakfast we begin descending for about 5 hours to Huaran. There a vehicle will take us to Ollantaytambo. In Ollantaytambo we will transfer by train to Aguas Calientes (2,000 m/6,561 ft) and spend the night there in a hotel. We get up at 5:30 AM for breakfast, secure our luggage at the hotel and take the early tourist bus to Machu Picchu. 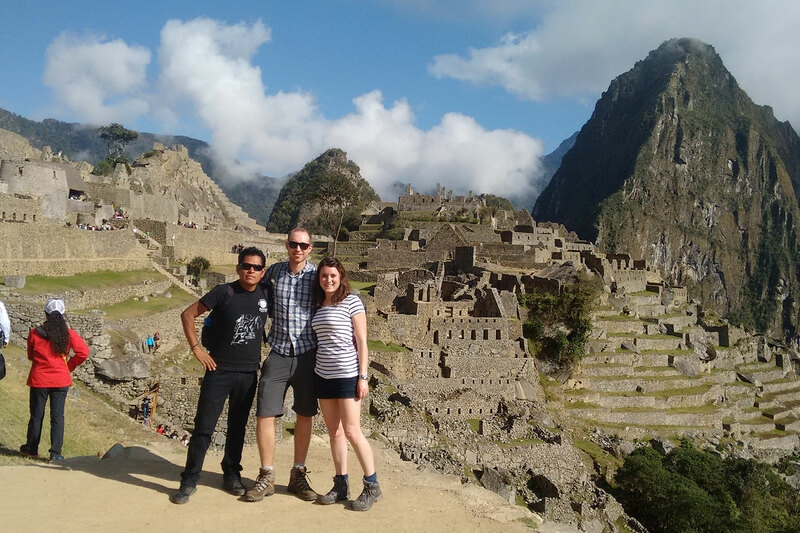 A walking tour at Machu Picchu (approximately 2 hours) is given by your guide and afterwards you can explore the amazing city by yourself. If you still have energy and bought the ticket, you can also climb Huaynapicchu (2,720 m/8,923 ft). It takes 45 minutes to reach the top of Huaynapicchu and you will get a magnificent view of Machu Picchu and its surroundings. Later you will meet your guide in Aguas Calientes “Machupicchu pueblo” (The trip down to Aguas Calientes can be reached by bus or by foot) for lunch (this lunch is not included in the cost of the trek) and to receive your train tickets back to Cusco. The ticket of the train is included in all tours to Ollantaytambo. Once you arrive in Ollantaytambo, a bus will take you back to Cusco. If you desire an extra night in Aguas Calientes, it can be arranged. 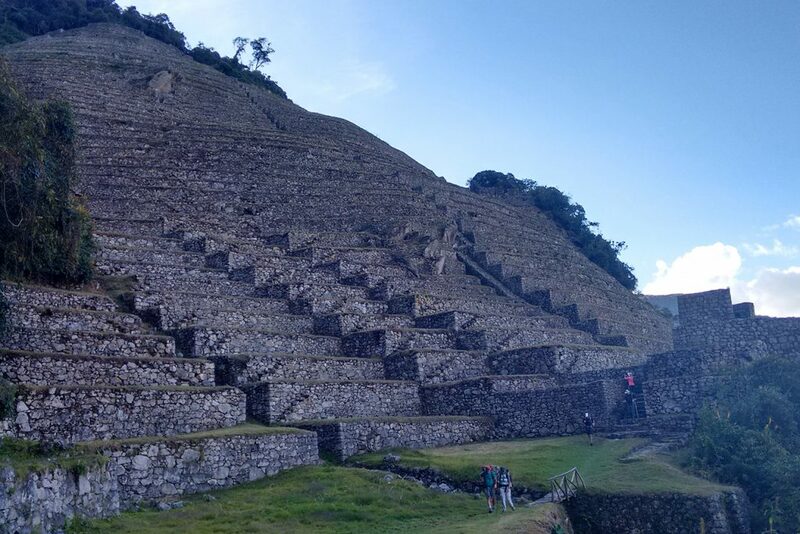 This option is very popular as it allows more time to explore Machu Picchu. You can also go to the hot springs in the town – a real treat after finishing the trail. Hot water for lunch/dinner on Day 1, breakfast/lunch/dinner on Day 2 and 3, and breakfast on Day 4. With adequate advance notice, we can supply boiled water to fill your water bottle or hydration pack.